The use of thermal imaging is not a new technology. It’s used by law enforcement when searching for runaways or others who may be lost. The thermal imaging can show a heat profile and helps the officers locate the individual. 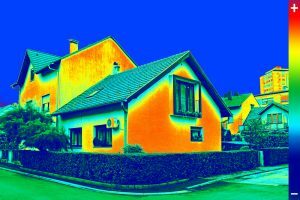 Thermal imaging is also used by home inspectors to check a home for heat leaks around doors and windows. The technology could soon be making its way onto our smart phones through the use of a thermal infrared camera. This new micro thermal camera (MTC) is a development that’s been in the works to make technologies smaller, more powerful and available to the greater public. The prices for these – typically-commercially used devices are more than $2,000. The new MTC will be affordable for the average user and will be able to be used for energy efficiency, personal safety, outdoor recreation and mechanical repairs. The use of passive infrared detectors measure temperature differences, but the new MTCs may be sensitive enough to not only measure temperature differences, but to be able to distinguish shapes of humans, objects and animals. The technology will incorporate an optical lens that would be used in a high-volume wafer-level sensor. Currently there is a thermal camera system with a custom lens that fits onto the iPhone and displays the thermal images on the phone’s screen. Through the use of the free app the user can capture still images and video and note temperatures in specific locations. Thermal sensors that are currently used as motion sensors don’t compare to the effectiveness of an MTC. The MTC will be able to “read” at a higher pixel level and because it can capture shapes it could be more useful to business owners that need security technology. One of the next steps in the advancement of the technology will be to allow it to capture clear images – rather than outlines of shapes – at a price consumers can afford and in a size that still melds with smart phone technology. UKA Optics is a manufacturer of standard and custom CCTV lens assemblies for image capture, barcode scanning, night vision systems, medical systems, hi-speed imaging, machine vision and robotics vision.